Yesterday, for a brief trial period, TfL introduced several exciting new Express Tube services. Trains on several lines skipped several intermediate stations, especially in zone 1, delivering passengers to their destinations more quickly than ever before. These enhanced services were a direct result of management sacking 200 employees more than they should have done last year, claiming everything was going to be OK, and then discovering otherwise when staff shortages transpired. Obviously these Express Tube services were excellent, especially if they happened to be stopping at stations passengers actually wanted to go to, and less so otherwise. The enhanced services were extremely popular, indeed strikingly so, and many potential customers took to the streets. TfL thoughtfully produced a digital map on their website to explain clearly how the new services worked and which stations were closed, which was a lot of stations. If anyone thought to change the settings an even clearer 'reversed' version was available, but very few people thought to do this. But how great were the Express services? I tried a few to find out. The Jubilee Express service was excellent, and proper fast. 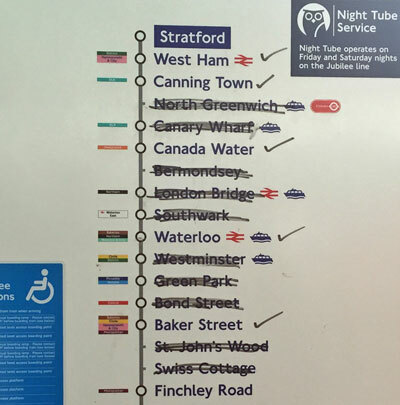 What's more, passengers were clearly shown what to expect on the line diagram at Stratford station, on which the upcoming stopping pattern had been displayed using a black marker pen. No other infographic I saw yesterday came close to the clarity of this. The driver was also excellent, explaining carefully to passengers which stations were about to be skipped, and what the next station would be. Sometimes this was a very long way away. For example the train didn't stop at either North Greenwich or Canary Wharf, whizzing straight through to Canada Water where Overground staff were in control. The next stop was Waterloo, and then the train zipped all the way through the West End without stopping before pausing at Baker Street, which was excellent unless you wanted to get off somewhere inbetween. I've never travelled from Canning Town to Finchley Road as quickly as this, it was an excellent service. The Bakerloo Express service was also excellent. Bakerloo line trains didn't bother themselves with all those annoying central stations, the ones where everyone gets off, they terminated short at Marylebone. What's more they skipped a whole load of stations on the final run-in, not stopping at as many as five stations immediately before Marylebone. If you didn't want to go to Paddington and did want to go to Marylebone, this was excellent. It would have been even more excellent had there not been another train immediately in front, causing us to pause in all the stations we weren't stopping at and slowing us down more than a normal train would have been. But TfL's electronic information couldn't cope with the new Express service. At Willesden Junction a display explained that trains were only running between Harrow and Queen's Park, which wasn't true. What's more the Next Train Indicator was convinced that the train's destination was Elephant & Castle, because it always is, except yesterday it was Marylebone, so this wasn't true. What's more the Next Train Indicator was also convinced the next train was "calling at all stations to Elephant & Castle", which it wasn't, not even all stations to Marylebone. Thankfully the driver was excellent, and carefully explained all the nuances the electronic systems couldn't, in particular the serial non-stoppingness of the final section. The Northern Express service was absolutely excellent. The only central London station served by Northern line trains was Old Street, which wasn't especially easy to get to unless you were in the area, in which case it was brilliant. The next five stations were all missed out, due to strategically-located staff shortages, but this didn't matter if you didn't want to get off at Bank or London Bridge. After Kennington the train only stopped five times on the way down to Morden, and didn't stop five times, which is clearly how a good Express service ought to work. All the important interchange connections were covered, so all was fine and good. The whiteboard at Old Street almost coped with the new Express service, except that somebody had written the two Clapham stations the wrong way round. It's an easy mistake to make, thinking that Clapham South is north of Clapham North, and nobody was inconvenienced. But TfL's electronic information couldn't cope with the new Express service. The automated announcements on the platform at Old Street declared that when the next train to Morden arrived, the next station would be Moorgate, but it wouldn't because Moorgate was closed. The automated announcements on board that train then announced that the next station was Moorgate, when in fact Moorgate was closed, then went on to (correctly) state that each of the next four stations were closed. The announcements continued to make this specific error, consistently deciding that the first closed station after an open station was open, and that subsequent closed stations were closed. The scariest part of the journey was immediately before arriving at Morden, when the scrolling display decided that "The next station is closed. This train will not be stopping at the next station." Thankfully we did stop, otherwise the train would have smashed into the buffers, but why would an electronic system know that? At Morden station, another glaring electronic error was on the Next Train Indicator. According to this, all the trains heading north were going to 'High Barnet via Bank'. In fact they were only going to Old Street, and Bank was one of the stations they wouldn't be stopping at. Thankfully the driver on the journey back was excellent, and carefully listed the few stations we would actually be stopping at, contradicting the electronic displays as necessary. The Circle Express service was of course excellent. Loads of stations were missed out, including almost all the ones where mainline trains terminate, which speeded everything up. There was an annoying section between Monument and Liverpool Street where the train actually stopped at four consecutive stations, but this was a frustrating blip and the service soon got back to skipping huge great chunks. Even better, trains were only running every 20 minutes, which might sound bad except that Hammersmith & City trains were only running every 30 minutes, so this was 50% better. But TfL's electronic information couldn't cope with the new Express service. Even though the Circle line is run using some of the newest trains on the network, it turns out they can't cope with seriously unusual stopping patterns. The onboard displays consistently declared that the train was stopping at the next station, even when that station was closed. Then, just before arriving, the message changed to assert that the next station was in fact closed, and that the next stop would definitely be the station after that, even if that were closed as well. This charade continued all around the circuit, a steady stream of digital inadequacy which regularly misfooted passengers. What's more, the entire Circle line destination system is of course predicated around a selection of important stations, none of which were actually open. 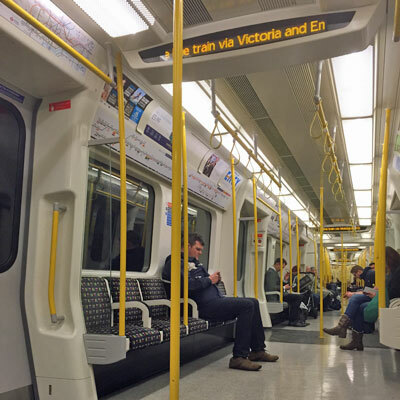 For example, the display on the front of the train initially said "Circle line via Victoria", even though Victoria was closed. Meanwhile the scrolling display inside the train declared "This is a Circle line train via Victoria and Embankment", which were two stations we definitely weren't stopping at. Thankfully the driver was excellent, kicking off the journey with the announcement that "This is a Circle line train calling at some stations". No really, he did, and this was faultless information. He then chipped in around the circuit to confirm the station we were really were stopping at next, rather than the repeated lies the displays and automated announcements were spouting. If you're still reading, there is a serious point here. The Underground's automated systems are generally incapable of coping with the unusual, so when the unusual occurs the outcome is misinformation. Restricted lists of destinations can't cope with irregular termini. Additional announcements designed for added clarity merely confuse when the status quo is breached. Automated messages designed to inform the public about closed stations misfire when wrongly triggered, or when the default information is unexpectedly incorrect. It's not ideal. Even though this is 2017, it turns out that the Underground's electronic systems are remarkably inflexible, and therefore unhelpfully misleading when the unexpected kicks in. Only the human touch was able to provide consistently constructive information during yesterday's strike service, because humans haven't been restrictively pre-programmed and can think for themselves. One day, maybe, more adaptable systems will be introduced which react to what's actually happening and allow the human element to be phased out. 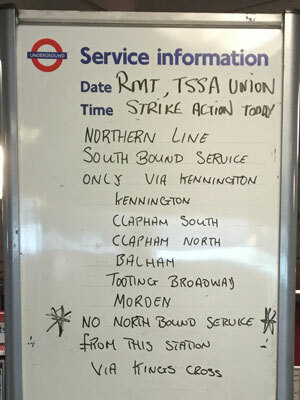 In the meantime it turns out that trained staff are the most reliable way to inform and reassure tube passengers... which I believe is precisely what yesterday's strike was all about.